The compact carpenter ant, Camponotus planatus (Roger), although primarily an arboreal species, is increasingly becoming recognized as a structural pest in Florida. This common name is still unofficial. A smaller, more "compact" and close relative of the Florida carpenter ant complex (Camponotus floridanus and Camponotus tortuganus) and often found living in close proximity with them, the compact carpenter ant is the subject of numerous inquiries to pest control operators in the South Florida area. Figure 1. Workers of Camponotus planatus (Roger), the compact carpenter ant (proposed common name), and Camponotus floridanus (Fr. Smith), the Florida carpenter ant. Photograph by Rudolf H. Scheffrahn, University of Florida. 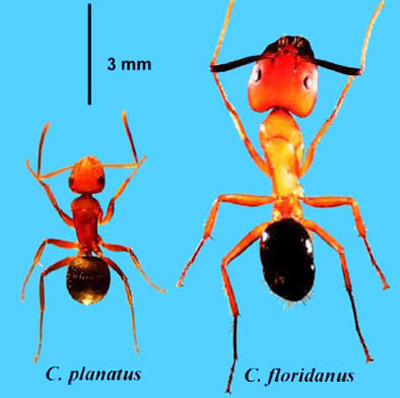 Now regarded as exotic to Florida (Deyrup 1991), the compact carpenter ant occurs widely in Cuba and abundantly from Mexico to Colombia (Creighton 1950), and is well-established in Sarasota, Tampa, and east Miami (Deyrup 1991) and in the Florida Keys (Deyrup 1988). Wheeler, in 1932, recorded these ants being in Miami, Ft. Myers and Coconut Grove. Further reports show compact carpenter ants to have reached Lee, Manatee, Monroe and Sarasota Counties (Deyrup 1989), Broward and Indian River Counties (Klotz 1995), and are well established in Palm Beach County (Warner unpublished observations). Figure 2. 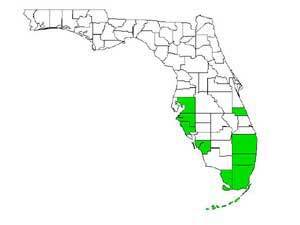 Map of Florida showing counties with Camponotus planatus (Roger) populations. The antenna of the compact carpenter ant is 12 segmented, with the terminal segment being slightly elongated and bullet-shaped. The scape is longer than the width of the head. Workers vary in size, ranging from 3 to 6 mm in length. Body hairs on the head, thorax and abdomen are abundant, long and golden, with few hairs on the legs and very few on the base of the scape. There is no stinger. 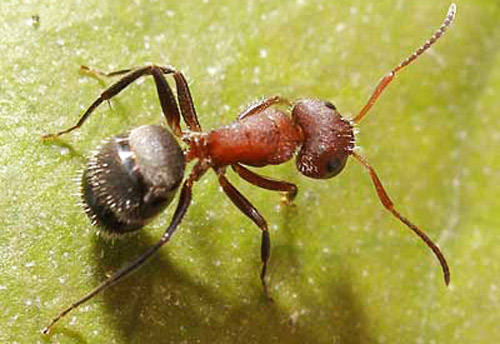 The thorax is evenly convex as is characteristic of carpenter ants. The thorax and head are ash brown and the gaster is blackish, as in Camponotus floridanus, but compact carpenter ants are smaller. There is one petiolar segment. This species is in the subfamily Formicinae, tribe Camponotini. Figure 3. Worker of Camponotus planatus (Roger), the compact carpenter ant. Photograph by Rudolf H. Scheffrahn, University of Florida. As with all members of the order Hymenoptera, the compact carpenter ant develops by complete metamorphosis, going through egg, larva, and pupa in silk cocoons and adult stages. Typically, a single queen will start a new colony, caring for her first larvae until they develop into workers, which then begin to forage for food. Workers then care for the queen and new eggs and larvae. The colony will continue to grow and will usually send out new winged reproductives, or alates, when the colony is two to five years old, depending on environmental conditions. Alates are usually observed from spring to fall, depending on the area and environmental conditions. As the compact carpenter ants increase in population and range, they are being noticed by wary homeowners more and more over the last few years, mostly foraging on exterior walls. Since this is a day-active ant, they tend to be observed more than other carpenter ants that tend to be nocturnal. Compact carpenter ants are rarely observed inside structures but have been seen entering under doors, cracks around windows and structural cracks and crevices. Unlike Camponotus floridanus or Camponotus tortuganus, alates (swarmers) do not fly in structures. Both the flight season as well as flight behavior have not been documented in Camponotus planatus. Workers are seen foraging in very dispersed trails or singly. They are active all day, even in direct sunlight and have been observed feeding on drops of honey on walls with surface temperatures as high as 37°C. (Warner unpublished observations). Foragers have been observed on trees, bushes, along sidewalks, through lawns and exteriors of structures. The most common habitats are hollow twigs, old termite galleries in dead wood and grass culms (Deyrup 1988) as well as voids in tree trunks and leaf axil bases in palms. Nests are usually difficult to find. Residual surface sprays will control the common complaints of compact carpenter ants as nuisance pests on building exteriors. If they can be found, direct sprays to nesting sites are recommended. Baits placed along trails will help in reducing colony populations. Caulking exterior openings and weather striping may also aid in control. Read and follow label instructions and precautions before using any insecticide. The authors thank John R. Mangold (Terminix) and Lloyd Davis (USDA) for their insightful comments and additional collection records. Creighton WS. 1950. The ants of North America. Bulletin of the Museum of Comparative Zoology at Harvard College 104: 1-585. Deyrup MA. 1991. Exotic Ants of the Florida Keys (Hymenoptera: Formicidae). Proceedings of the 4th Symposium on the Natural History of the Bahamas. 21 pp. Deyrup MA, Carlin N, Trager J, Umphrey G. 1988. A review of the ants of the Florida Keys. Florida Entomologist 71: 163-176. Klotz JH, Mangold JR, Vail KM, Davis Jr. LR, Patterson RS. 1995. A survey of the urban pest ants (Hymenoptera: Formicidae) of peninsular Florida. Florida Entomologist 78: 109-118. Publication Date: January 2001. Reviewed: February 2014. Latest Revision: August 2017.